Electron Backscatter Diffraction (EBSD) is used in combination with a Secondary Electron Microscope (SEM) to measure the orientation of crystals with respect to a reference frame. Within the scope of my PhD project, which is to gain further insights into the rheological behaviour of polyphase lower crustal rocks, I measure the orientation of quartz and feldspar in mylonites with different grain sizes to evaluate deformation mechanisms and their determinant variables. As currently no one else at the Institute of Geology and Mineralogy in Cologne is working on this subject or even using the EBSD technique, I was lucky to receive a GSGS Travel Grant to attend this short course to deepen my skills and knowledge about the EBSD technique. The short course included several lectures about the principles of crystallography and diffraction but also some advanced topics. Practical sessions were offered at the SEM starting with the very first steps like sample preparation or optimal measuring conditions. Eventually, EBSD measurements were accomplished. Once a data set has been obtained, the question arises how to process the data? The BGI offered free access to a set of processing software (Mtex, Dream3D and more). 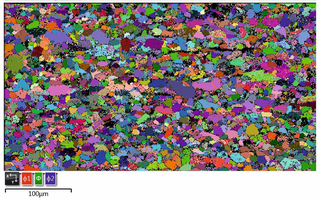 During a number of practice lessons one could have a guided try at creating different EBSD maps (see Fig. 1). Finally, at the end of the week several research talks and a poster session took place to discuss the numerous application possibilities of the EBSD but also to talk about own research. The short course was an excellent opportunity for me to consolidate and expand my knowledge about EBSD and related topics and to clarify unresolved issues concerning the operation of the EBSD measurements. Furthermore, I discovered the processing software Mtex as a useful tool for my further research work. Moreover, I met other scientists dealing with similar topics as I do and contact was established for further exchange and discussion.